You are here: Home The Market Is it time for a mid-course correction? Comments Off on Is it time for a mid-course correction? Is it time for a mid-course correction? I expect the punditry to assemble the evidence, with each concluding that (s)he has been right all along! Last week I expected that plenty of data packed into a 3 ½ day week could lead to some fireworks. While the market move was not overwhelming, the basic concept proved out. 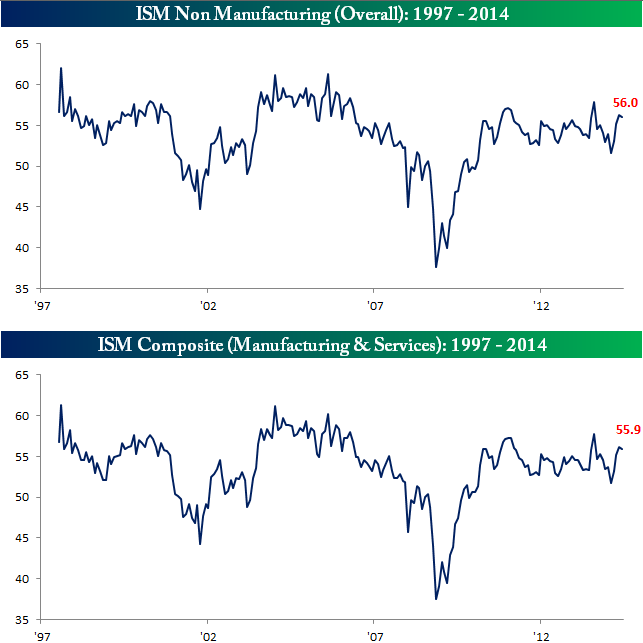 Economic data generated repeated upside surprises and stocks pushed to new highs. The theme guess was as good as any, unless you wanted to focus on the Dow 17K party watch. Naturally we would all like to know the direction of the market in advance. Good luck with that! Second best is planning what to look for and how to react. That is the purpose of considering possible themes for the week ahead. The end is near. It will all turn out badly. (These sources are pretty easily found. If you are having trouble, just use The Google to find Schiff, Durden, or Faber). A correction is coming. The main argument is often called “statistical” but is not really based upon statistics. It is merely an observation that the market historically has shorter cycles than we are currently experiencing. (Sources too numerous to mention). QE is ending. Since the market has depended on this liquidity, stocks will now falter. You can easily find a two-variable chart to prove this point. (Check here for a Silver Bullet candidate in waiting). Things are better – the economy, earnings, and future prospects. Take a few minutes and watch this discussion from Rebecca Patterson, Bessemer Trust Managing Director. She has been right on the market and has clients overweight in stocks. She also has advice for those just thinking about stocks. This is a good example of mainstream buy-side thinking. Things can get even better. Jeremy Siegel sees Dow 18K and maybe even 20K by the end of the year. Here is why. Which of these viewpoints is correct? As usual, I have some thoughts that I will share in the conclusion. I am devoting extra emphasis to investment analysis in this mid-year post (and I might be off next weekend). First, let us do our regular update of the last week’s news and data. Readers, especially those new to this series, will benefit from reading the background information. There was some important good news last week. Companies are raising earnings guidance. Earnings guru Brian Gilmartin sees a chance for 9 – 9.5% earnings growth in Q2 and possibly more in Q3. The forward PEG ratio of 1.81 is the lowest since January, 2012. Brian is citing data that are important for many top fund managers. 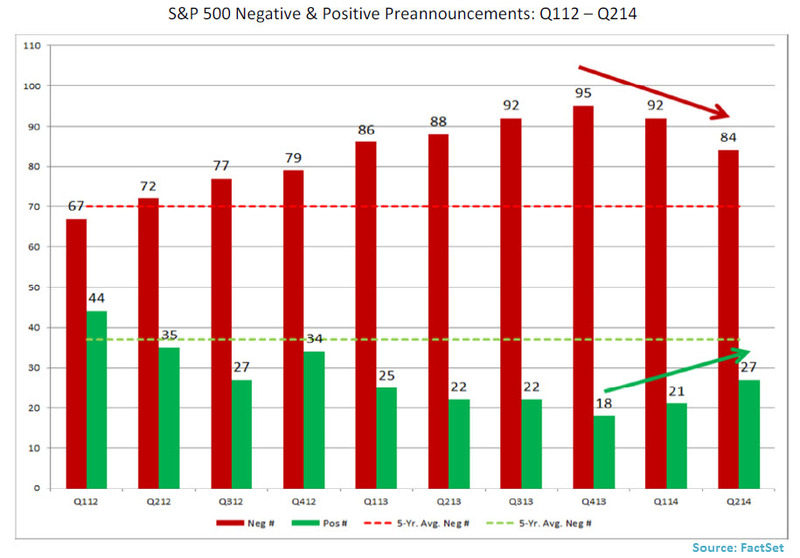 Along similar lines, FactSet reports the sharp decline in negative preannouncements. ADP private job growth for June was strong – 281,000. Steven Hansen at GEI has the story with both analysis and charts. He has also written that the ADP is actually doing better at measuring job changes than the BLS. I have long maintained that the ADP report should be viewed as an independent measure of employment using a sound but different methodology. Eurozone unemployment remains high at 11.6%. (ABC News). But it was the best in almost two years. The Official employment report was strong. The spinmeisters were out with their best shots within a few minutes of the data, but this time they are really reaching. The basic take is a net job gain of 288K on the payroll survey and a decline in the unemployment rate to 6.1%. This is good news and was interpreted as positive. In addition, most new jobs have high pay. 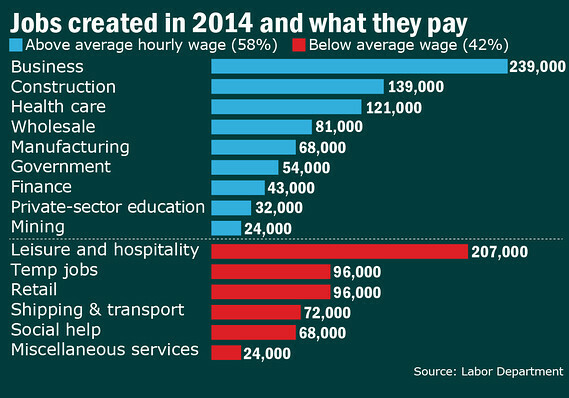 The idea that more than half of the jobs pay above the average wage should not really be a surprise, but there has been a buzz suggesting that new workers are all burger-flippers. Here is the reality from MarketWatch. The economic news included some negatives as well. Most of the fresh negatives were small misses in economic data. Feel free to add things that I missed in the comments, but please remember – this is a weekly update focused on fresh information. Average hourly earnings are only up 2% barely matching inflation. Joe Weisenthal notes the positive aspect of this – no wage pressure on the Fed. Labor force participation was unchanged at 62.8%, down from 65.3% a year ago. 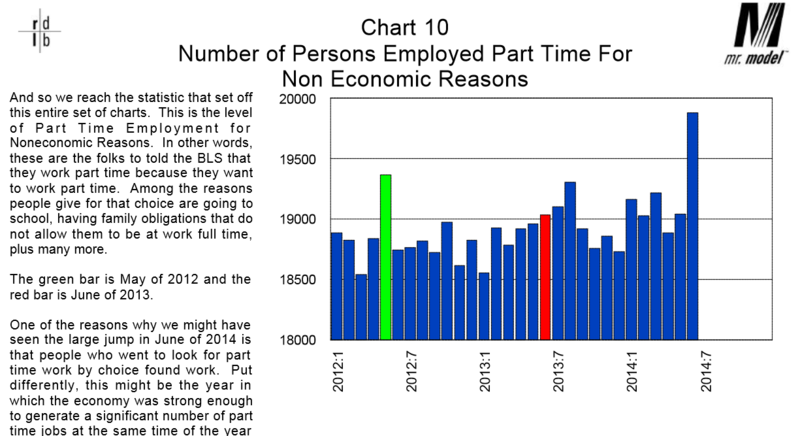 Part-time employment accounts for much of the gain in jobs. The price of gas has been flat for almost three months. It is slightly above its price of 1 and 2 years ago, but less than its price of 3 years ago. The 4 week average for gas usage has remained positive for a long time. Typically by now the year’s high price for gas has been set. If so, this will be the third year in a row of a decline in that peak price. It also means the Oil choke collar is disengaging, despite ongoing turmoil in Iraq. Mortgage and refinance applications are down – back to post-recession lows. New Deal Democrat covers this one, too. 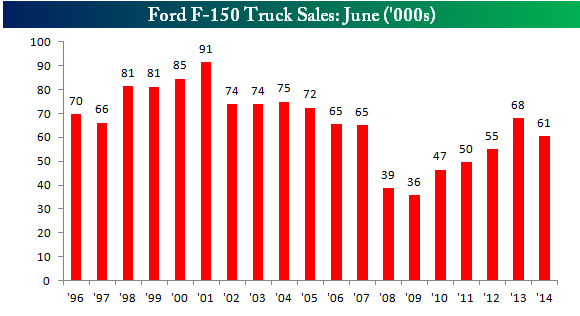 F150 sales declined. Bespoke has the story and a helpful chart. They also note that the upcoming release of a new model is a factor. This has been a good read on construction and small business. Ebola. The spread in West Africa is accelerating. There is no cure and a 90% death rate. Health workers are affected, and many local victims actually believe that the health teams brought the disease. (LA Times). Eddy Elfenbein is a constant source of both wisdom and wit. For this week’s chuckle, see how he takes a pedestrian story (Booze at the Fed) and makes it humorous. RecessionAlert: A variety of strong quantitative indicators for both economic and market analysis. Doug Short: An update of the regular ECRI analysis with a good history, commentary, detailed analysis and charts. If you are still listening to the ECRI (2 ½ years after their recession call), you should be reading this carefully. Doug includes the most recent ECRI discussion, which has been consistently bearish, including the blown call on the recession. We included Doug’s chart of the Big Four last week, but data devotees should check it whenever there is a big release. It has now been updated for the employment data. Georg Vrba: Updates his unemployment rate recession indicator, confirming that there is no recession signal. Georg’s BCI index also shows no recession in sight. For those interested in hedging their large-cap exposure, Georg has unveiled a new system. Georg now has another new program, with ideas for minimum volatility stocks for tax-efficient returns. Bob Dieli does a monthly update (subscription required) after the employment report and also a monthly overview analysis. He follows many concurrent indicators to supplement our featured “C Score.” One of his conclusions is whether a month is “recession eligible.” His analysis shows that none of the next nine months could qualify. I respect this because Bob (whose career has been with banks and private clients) has been far more accurate than the high-profile TV pundits. We have a very light week for real news. FOMC Minutes (W). Despite the announcement, the press conferences and the speeches, expect intense scrutiny. Initial jobless claims (Th). Lost in the avalanche of data last week, but still the best fast read on employment trends. JOLTS report (T). This report is starting to get some attention, but most still miss the key points. Job openings. Quit rate. This is not a way to back into net job growth, which is done better in many other ways. 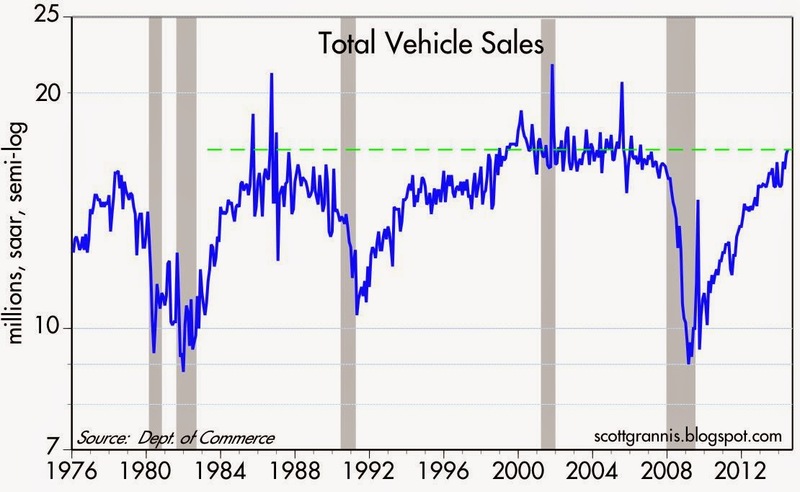 Wholesale inventories (Th). May data, but still relevant since inventories are the key aspect of the debate over GDP. This is a big week for FedSpeak. While there is no reason to expect a surprise, the market will pay attention to each and every utterance. While the financial markets have adjusted to the current Iraq story there is continuing attention to any breaking news. There is also the possibility of further escalation in Ukraine. Felix remains bullish and with a touch more confidence. The positive elements remain modest in strength. Uncertainty remains high – typical for a trading range market. This week we were fully invested in three of the top sectors for our trading accounts. That remains our position going into the week ahead, although some of the strength is outside of the US. You can sign up for Felix’s weekly ratings updates via email to etf at newarc dot com. The single best advice I have for traders this week is to read the wisdom of my friend, Dr. Brett Steenbarger. He took a new job and moved away from our home town (Naperville) a few years ago. I miss our occasional discussions over coffee and also his blog. His work requirements prevented him from writing for a time. Brett is back in action, so traders should listen up. His current advice resonates strongly with my own experience. If you are just doing the routine – reading the same material and following the tried and true – you have no edge. He explains why, and what to do about it. I review the themes here each week and refresh when needed. For investors, as we would expect, the key ideas may stay on the list longer than the updates for traders. The current “actionable investment advice” is summarized here. In addition, be sure to read this week’s final thought. The market still did not provide the “dip to buy” sought by so many. The gentle upward action is fine for long-term investors and excellent for those trying out our Enhanced Yield approach. We added positions in stocks that represented good value with solid income from call premiums. Here are some key themes and the best investment posts we saw last week. Ignore hysterical headlines! Josh Brown provides an excellent case in point, showing a series of headlines designed to attract your attention. The question is whether they are helpful and profitable for the average investor. I cannot even give you a taste without spoiling the story, so please check it out. Upside rate risk is a concern for interest-sensitive investments. Michael Aneiro of Barron’s quotes BAML’s head of global rates and currencies research, David Woo, who thinks that Chinese buying has served to dampen rates – so far. Woo doesn’t expect the Chinese shopping spree to persist to the same degree for the rest of the year, however. He sees a combination of slowing Chinese purchases and an accelerating U.S. economy finally pushing yields higher in the second half of the year—perhaps to as high as 3.5% on the 10-year note from the recent 2.6% area. Aneiro also cites Deutsche Bank’s chief international economist, Torsten Slock, who sees a near-term “non-linear inflection point” for fixed income. See also Alen Mattich at MoneyBeat, Are Markets Underestimating Rate Hike Risks? Beware of chasing returns through market timing. A new study from the St. Louis Fed, Chasing Returns Has a High Cost for Investorslooks at fund flow data, comparing return-chasing behavior to buy-and-hold over a five-year period. The cost of this aggregate chasing behavior was a loss of 2%. It would have been higher if the holding period were longer than five years. What has worked so far in 2014 and what might be over-owned. Blaine Rollins of 361 Capital does a fine briefing which I read every week. This week he has a good summary of the best and worst ETFs and stocks for the first half of 2014. He goes on to show the sectors that are currently over and underweighted compared to historical averages. See the full post for plenty of helpful tables and charts. Some people cannot even get started with investing. William Cowie offers some ideas about how to get started. (HT Charles Kirk, whose weekly magazine is always a great source). Cowie analyzes the sources of fear and how to handle it. Be sure to read to the end for the Alaskan pilot story. Fear of being exposed as unintelligent when I don’t get it. Do not try to buy at the market bottom. Here is some amazing research from Ben Carlson. 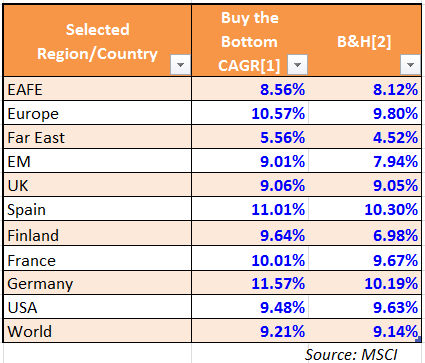 Assume that you only invested within 17% of the market bottom. (If you think anyone can time better than that, you need a reality check). It turns out that the results are not far from buy-and-hold and even worse for some indexes. (Regular readers will note that we cited prior research showing that you did not lose much from investing at market tops). If you are worried about possible market declines, you have plenty of company. This is one of the problems where we can help. It is possible to get reasonable returns while controlling risk. You can get our report package with a simple email request to main at newarc dot com. Also check out our recent recommendations in our new investor resource page — a starting point for the long-term investor. (Comments and suggestions welcome. I am trying to be helpful and I love and use feedback). Of the four candidates listed in the introduction, my conclusions are somewhere between #4 and #5 – the good and the really good. Here is why. This error will become more obvious as the Fed tapering continues. Remember the questions about “who will buy our bonds?” that were offered a year ago. It turns out that there is a solid market for bonds, which I explained three years ago. Remember how stocks were supposed to collapse as soon as the Fed started to taper? Not happening. As the Fed steps back, the evidence will be clear. Each of us needs to ask what could make us wrong? What evidence would change our plans? What is working as expected? What are the biggest risks –What would change my mind? I will comment briefly on each, keeping in mind that the WTWA series summarizes conclusions rather than providing the full analysis. Corporate earnings are coming through pretty well. The multiple on forward earnings is increasing, as I have consistently predicted would happen when earnings confidence increased. The biggest surprise was the economy in Q1. Economists expect improvement because there are slack resources – both labor and capital. The default trend should be improvement. Q1 was a big miss for those forecasts. The markets seem to have supported my general thesis. Stocks have improved (but with a big drag) because of earnings. Bonds have also been strong because of weakness in the worldwide economy. I am encouraged that both bonds and stocks have reacted as expected, so my thesis is unchanged. I expect a stronger economy. This means better earnings and higher interest rates. This is dangerous for bonds, bond funds, utilities, and other yield-based investments. It is fine for stocks, as long as rates stay below 4.5% or so on the ten-year note. Geo-political that is not on the current radar – a true black swan. An increase in the PCE index that was not accompanied by strong economic growth. Wage increases that were not accompanied by strong economic growth. Declining profit margins that were not accompanied by strong economic growth and increased revenues. An increase in the chances for a business cycle peak (the official definition of a recession). Remote at this point. An increase in financial stress to our trigger point. Remote at this point. In the absence of a recession, the current economic cycle could continue for much longer – two years or more. Looking at the length of past cycles or a CAPE ratio based on short cycles is no help in this environment. There was a sharp decline and a slow recovery. It would not be surprising to see earnings of $130 on the S&P 500 and a multiple of 18.5 (see chart below). That would be another 20% or so. If it happens, you will read articles explaining that it is completely consistent with past markets, and not even the bullish peak. It would achieve the Dow20K target I introduced four years ago, when many thought I was crazy. Is it a surprise that the rebound is more gradual? The most difficult investment decisions involve rejecting prevailing wisdom. When everyone is itching to call for a correction, a recession, inflation, deflation, or anything else that will generate page views, it can be difficult to stay the course. As the economy improves and interest rates rise a touch, expect that new alarms will be sounded. 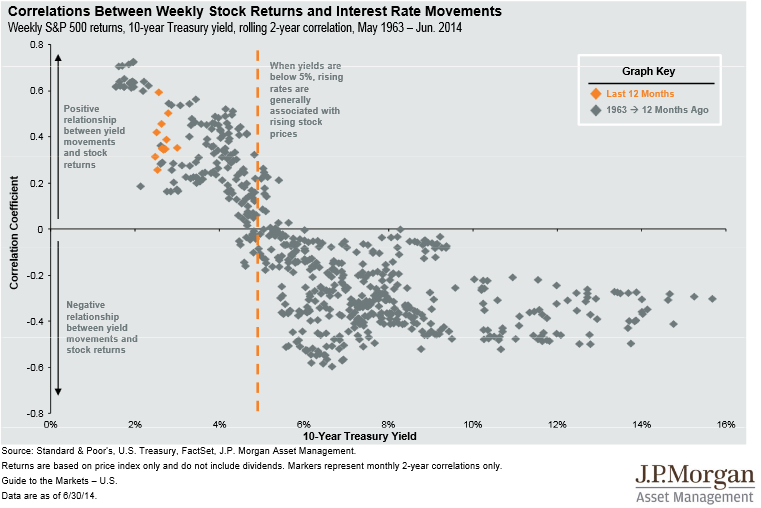 It is important to remember that the first leg up in rates is merely a return to normalcy. JP Morgan’s quarterly guide to the markets is well worth some thoughtful consideration. Here is a key chart. It shows that rising rates are consistent with higher stock prices when the rates are below 5%. As I have often explained, this is because the extremely low rates to which we have all become accustomed are associated with a weak economy and extreme skepticism. We were told by many experts over for many years that good economic news – which probably couldn’t be produced anyway – would be bad news once it eventually came. Well, it’s here and the market likes it. How about that? This post is even longer than usual. The topic is important and the issue is timely. Rightly or wrongly, I have placed more emphasis on the WTWA articles, giving up plenty of Saturdays and not doing as many shorter weekday posts. I am pleased to see that this has earned some professional recognition (#4 and not even counting my vibrant community at Seeking Alpha) in the latest list of blogs by financial advisors. As I look at the list I am delighted to be in this company. So many other investment news sources have an agenda – newsletter, conferences, page views, or sale of a single asset. In sharp contrast, the financial advisors on this list do not benefit unless their clients do as well. Those listed are generally like me – recommending a range of products and finding what best suits a particular client. I do not need a rising market to succeed, and neither do they. We just need to help clients match risk and reward in a way that fits their needs. It is a special group, and I am proud to be a member. Jeff Miller, author of A Dash of Insight, is a former college professor with a hands-on, real world attitude. His quantitative modeling helped inform state and local officials in Wisconsin for more than a decade. A Public Policy analyst, he taught advanced research methods at the University of Wisconsin, and analyzed many issues related to state tax policy. Jeff has worked for market makers at the Chicago Board Options Exchange where his approach included finding anomalies in the standard option pricing models and developing new forecasting techniques. He has set up a general research consultancy for professional traders at all of the Chicago financial exchanges, and has managed investment partnerships and individual accounts through NewArc Investments Inc.